Roy brings his skill as a fine concertina player and singer. He can move effortlessly from a traditional ballad to shanty to music hall ditty. 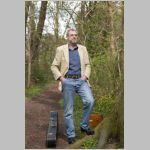 His program is peppered with songs from his beloved Cheshire and his self-penned songs sit comfortably alongside the genre and are being picked up and sung by lots of other artists. A night not to be missed.